When you place interactive elements into the Edge Animate Timeline, it’s a good idea to change the cursor attribute to provide a visual clue to your audience. Knowing that an element is (say) clickable, sizable, or what have you makes the audience more inclined to interact with the composition. If the cursor never changes, then your viewers may never know they could have clicked instead of just sitting there. When you create, say, a button that your audience can interact with, your users expect some kind of signal to show them that part of the animation is clickable. A clear way to provide such a signal so your audience can interact with an element is to change the shape of the cursor. You do that by specifying attributes for the cursor. Read on. *Pointing finger: Indicates a link to click. Watch: Indicates that something is loading and/or that the audience should wait for something to happen. Sizing: Indicates that the audience can resize something such as a window or a column or a row. 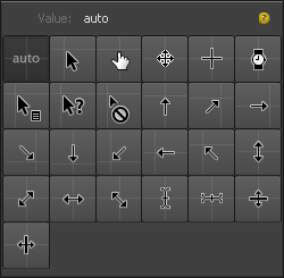 Edge Animate provides a wide range of cursor attributes. Good animators always provide as many visual clues to their audience as possible. That’s how your audience realizes when and where an element of your composition is available for interaction. 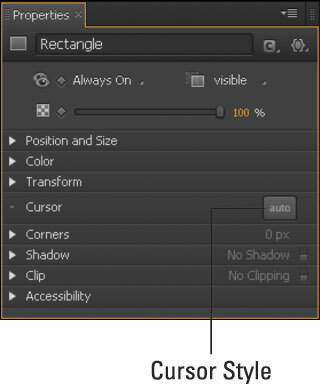 Adobe Edge Animate CC allows you to change how the cursor looks by changing its attributes. Here is how to change the cursor into a pointer when you hover over a button in your composition. Select an element, such as a button. From the Properties panel, click the Cursor Style icon as indicated in the figure. Choose a cursor attribute from the menu. Click the Cursor Style button to open the Cursor Attributes. To test that your cursor attribute is working, simply preview it in a browser. When you hover the mouse pointer over the element, it should change to a pointing finger, as shown. 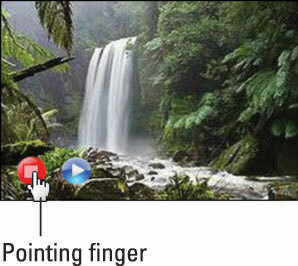 Here the cursor changes to a pointing finger when you hover over a button.